Square-Tail Lodge, owned and operated by Bob White, has been in continuous operation since the mid 1960's. Bob, having twelve years of wilderness guiding experience, extending from the Laurentian mountains to the upper end of the James Bay and the East coast of Hudson Bay, decided in 1964 to open his own fishing camps. Reports of record size brook trout and great walleye fishing coming out of the Broadback river system, encouraged him to explore this area. He made two trips, one in 1964 and another in 1965, finally settling on the North branch of the river. The first cabin on Lac Frotet was built in 1966 and another cabin on Lac Troilus was completed the same year, allowing Bob to take his first guests the fall of that year. At first the camp was only accessible by float equipped aircraft from Chibougamau, however, in the mid 90's a Hydro road was built and a connecting road to a mine North of Troilus gave road access to the camp. No longer needing the expense of air travel has permitted us to keep our rates well below other camps that still need to rely on access by aircraft. The area still remains remote and offers our guests a truly wilderness experience. We can accommodate up to 12 guests at our camp on Lac Troilus. Lodging is either log or frame cabins that sleep 2 to 4 guests. All cabins are comfortably furnished and made up daily. 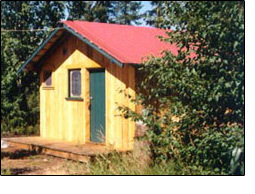 Some cabins have complete washroom facilities, and others use a central washroom with showers and flush toilets. A full course menu is expertly prepared and served in our main dining room. Buildings are either wood or propane heated, and all have electric lights. Freezer space is available for freezing and storing your catch. We are pleased that we still offer the same quality of fishing that we had when we first started our operation. We have accomplished this by limiting the number of anglers per week. While we can accommodate 12 fishermen weekly, our average is six on any given week. Single hook and barbless lures has meant more fish released unharmed. We also encourage the release of the larger walleye and pike to maintain the genetic strains. 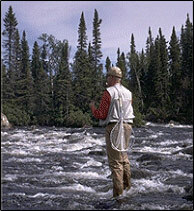 All rivers and streams are restricted to fly fishing only, as well, a catch and release policy is enforced on all trout fishing, with the exception of trophies that will be mounted. "My goal has always been to leave this territory with the same quality of fishing that it had when I first explored it in 1964." Discover why over 80% of our clients are repeat guests.